Now that spring is upon us it is time to dust off our gardening gloves and tools and start preparing our gardens for summer months. For gardeners who specialise in Australian natives then the file 'P&G69/298 – Parks & Gardens – Published Articles and Papers – Parks & Gardens Personnel', our ArchivesACT Find of the Month, will be of particular interest to you. This file contains a collection of draft articles written by Parks & Gardens staff in the years 1970 to 1972. Covering topics from seed germination to dealing with pests and diseases of native plants, there is a wealth of information on this file for keen gardeners. The article we present here was written by D.K. (Keith) McIntyre in response to the "many queries on the methods we employ for propagation of native species." It was believed that "This article should therefore be valuable to both amateur growers and nurserymen alike" and first published in 'Australian Plants' (Vol.7, no.46, March 1971), the journal of the Australian Native Plants Society. Metric conversions have been added to the text as well as a few reference notes. One part of this article we were unable to identify was the make-up of "Esseminal", described as a "mixture of essential elements." Is this a brand name product or a secret in-house creation of the National Botanic Gardens? Hopefully this article will assist Canberra gardeners produce vibrant garden displays that all Canberrans can enjoy. Over a period of several years propagation methods for growing Australian Native plants have been developed at the Canberra Botanic Gardens. These methods are continually being changed and improved. This article outlines the current methods and the reasons for their use. When cuttings are taken on field trips a long way from Canberra, they are immediately wrapped in wet newspaper and stored in a refrigerator if one is available. On arrival at the nearest airport the wrapped cuttings are placed in plastic lined boxes and air freighted back to Canberra. On arrival in Canberra they are placed in a refrigerator if they can't be dealt with immediately. Soft cuttings are potted first, and harder material is left till last. This method proved successful with very large numbers of cuttings sent back from Western Australia on a recent field trip. The experience gained from this trip showed that although soft cuttings showed some deterioration after 3-4 days, medium and hard cuttings travelled well. Cuttings taken on short field trips are immediately wrapped in wet newspaper and placed in a refrigerator (if one is available in the vehicle) or otherwise kept in a cool place. They are potted as soon as possible on return to Canberra. Cuttings taken in the Botanic Gardens or locally are immediately placed in plastic bags, moistened if necessary, and potted as soon as possible. These methods of handling cutting material prior to potting have produced very good results for most species. The potting mixture used is 1/3 perlite, 1/3 peat moss and 1/3 washed river sand, sterilised at 140°F (60°C) in a steam/air steriliser for 30 minutes. 4" x 4" (10 x 10 cm) plastic punnets are filled with the mixture and this is pressed down about ½" (1.27 cm) with a wooden block (Fig 1) to make it firm. Fig 1: Method of filling punnets. 4" x 4" (10 x 10 cm) square punnets are used because they use all the available bench space (whereas round containers do not) and also usually only a small number of any one species is required at a time. 25 cuttings, or less if the cuttings are larger, are placed in each punnet and these are immediately watered with a watering can. Watering, sufficient to keep the cutting mixture moist but not allowing it to dry out or get too wet, is done by hand with a fine spray from a hose. Watering is done when it is required and this may be up to four times a day in the summer. The bottom heat is set to give 70°F (21°C) in the rooting zone of the cuttings, and this is controlled thermostatically. The only heating in this plastic house is provided by the bottom heat in the benches. Four sets of glass louvres, a small exhaust fan and the door provide the ventilation. During the summer a leak hose is placed on the roof and this provides some cooling. Excellent results have been obtained in this house despite its many obvious defects. However it is planned to rebuild the house this year, replacing the plastic walls with glass, installing thermostatically controlled heating and cooling, and installing an automatic misting system. The benches and bottom heating will be unchanged. It is hoped these modifications will further improve the propagation of natives from cuttings. To this stage no rooting hormones are used in the general propagation of cuttings but experiments into the use of powders and dips are being carried out, and if they prove successful the use of suitable hormones will be included in routine propagation. When cuttings are rooted they are taken out of the punnet carefully and those with well developed root systems are potted on into clean sterilised 3" (7.62 cm) dia. earthenware pots. Cuttings which are still healthy and have not rooted may be returned to the punnet and placed back in the plastic house until they produce roots. If the cuttings have rotted and the species is valuable, they may be recut and returned to the punnet. The potting mixture used in the 3" (7.62 cm) pots is a modified UC (University of California) mix which has been sterilised at 140°F (60°C) for 30 minutes with steam/air. This mixture has been recommended by Parks and Gardens Research Section, Yarralumla Nursery, Canberra. About 1/2" (1.27 cm) of 1/2" dia. Washed river gravel is placed in the bottom of each 3" (7.62 cm) pot to cover the drainage hole. The rooted cutting is then placed in the pot filled with sterile UC mix. The pots are then watered and placed in cold frames. The cold frames protect the young plants from wind, heavy rain and frost. The covers may be propped open 2" , 6", 12", 16", (5 to 40 cm) taken off completely, or closed completely depending on the prevailing climatic conditions and the tenderness of the plants. Some frames have thermostatically controlled bottom heat, supplied by plastic covered floor heating cables embedded in concrete. During winter frames are closed at night and frames without bottom heat are covered with an additional layer of hessian or aluminium foil to prevent frost damage. 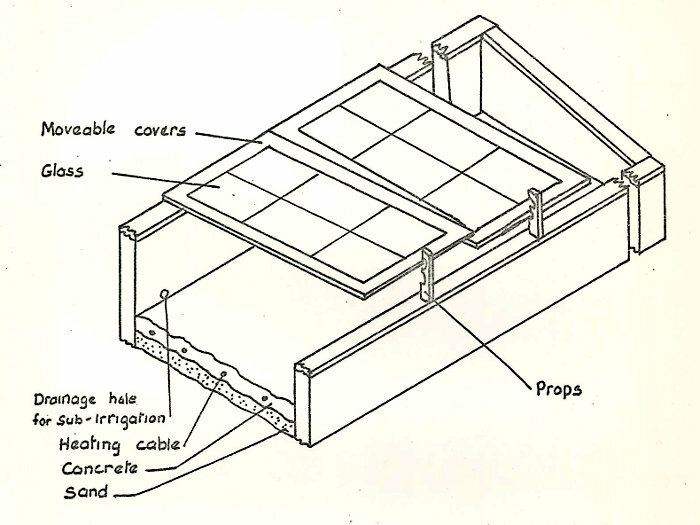 Fig 3: Section through cold frame. Watering is done by hand with a fine spray from a hose at intervals, enough to keep the soil moist but not too wet. Some frames have drainage holes and watering can be done in these by sub-irrigation which has advantages over overhead watering for plants which are susceptible to damping off and other collar diseases. The lower sides of the cold frames are facing north, and the whole area is covered with 64% Sarlon shade cloth on a pipe frame 7' (2 m) above the ground. The plants remain in 3" (7.62 cm) pots until they have produced a good root system. This is determined by tapping the contents of the pot out and observing root development. When the plants have reached the required size they are potted on into plastic bags (normally 9" x 9" (23 x 23 cm). Plastic bags are filled 6 at a time by using a frame with 6 galvanised iron tubes 5" (13 cm) in dia., 7" (18 cm) long for 9" x 9" (23 x 23 cm) bags and 13" (33 cm) long for 12" x 9" (30 x 23 cm) bags. The bags are placed on the frame and held in place with 2 clips (Fig 4). 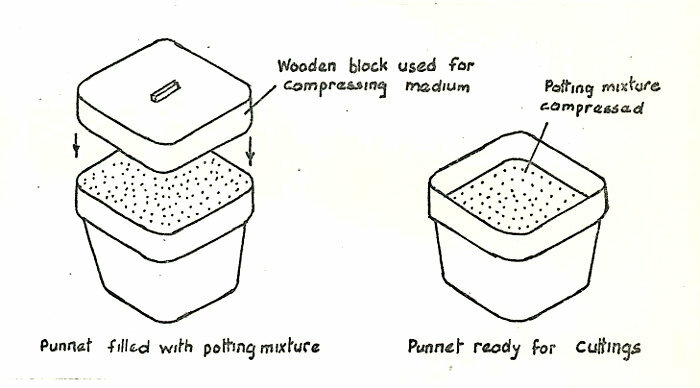 Fig 4: Method of filling plastic bags, and transplanting plants from 3" (7.62 cm) pots. This method of filling plastic bags was developed at the Canberra Botanic Gardens by Mr I. Colaric. The bags are then filled by shovel with the modified UC mix (same as for 3" (7.62 cm) pots). The frame is lifted off leaving the filled bags behind. The soil is compacted by banging them down on the bench. If the plants are going to be overhead watered, the bags are filled to within 1" (2.54 cm) of the top, but if, as is the usual case, they are to be watered by sub-irrigation, they are filled to within 1/4" (6.35 mm) of the top of the bag. The plants in plastic bags are then put into sub-irrigation bays. 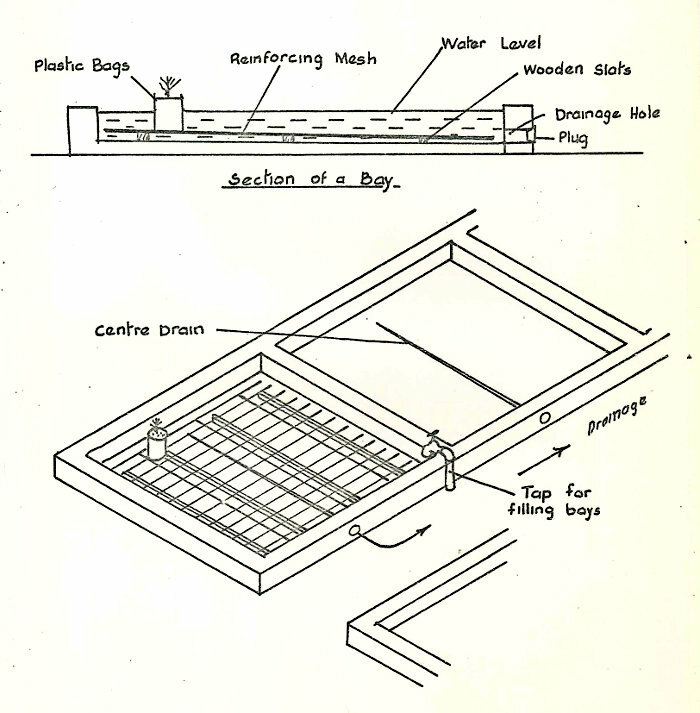 (Fig 5) They are placed on steel mesh which rests on 1" (2.54 cm) wooden slats (previously treated with copper naphthenate) so that the bottom of the bag is always at least 1" (2.54 cm) above the base of the bay. The bays are flooded with water from taps at the side, and because the bags are off the ground the water reaches all parts of the bay quickly ensuring even watering, and also quick drainage. Water is taken up through the holes at the base of the plastic bags and rises by capillary action above the level of the water in the bay to the top of the soil in the bag. When this occurs water can be seen at the surface. When the water has reached the top of all bags in a bay, watering is complete and the plugs are removed. The water drains out of the bags quickly because they are raised. The water that drains out is only the free water. The whole watering process is usually finished in two hours. During the summer the bays may be flooded almost every day, but at other times of the year less than this, depending on the plant requirements. Sub irrigation has certain advantages over overhead watering; work can be done on and around plants while they are being watered; it is not affected by wind, which causes non uniform watering in overhead systems; plants which are susceptible to damping off and collar infections are far less likely to be affected when watered by sub-irrigation because the above ground part of the plant is not wet; weeds seem to be far less prevalent under these conditions; and root systems tend to grow down and are not concentrated near the top of the pot, as is often the case with overhead watering. The soft straight sided sides of the plastic bags themselves tend to prevent root curling, and when this is combined with the advantages of sub-irrigation the root systems produced are excellent and give very few problems in the later life of the plant. All sub-irrigation bays are covered with 64% Sarlon shade cloth on a pipe frame 7' (2 m) above the ground. 5" x 3" x 2" (12.7 x 7.62 x 5.08 cm) deep plastic punnets are filled with a moist 50/50 mixture of perlite and washed river sand which has been sterilised at 140°F (60°C) for 30 mins. The mixture is compressed firmly with a wooden block. This is important because the medium has to be packed firmly to permit capillary movement of water to prevent the seeds drying out. The seeds are sown on the surface and covered with 2 to 3 times their depth with the sand/perlite mixture, which is pressed again with the wooden block. The punnets are then placed on capillary beds. 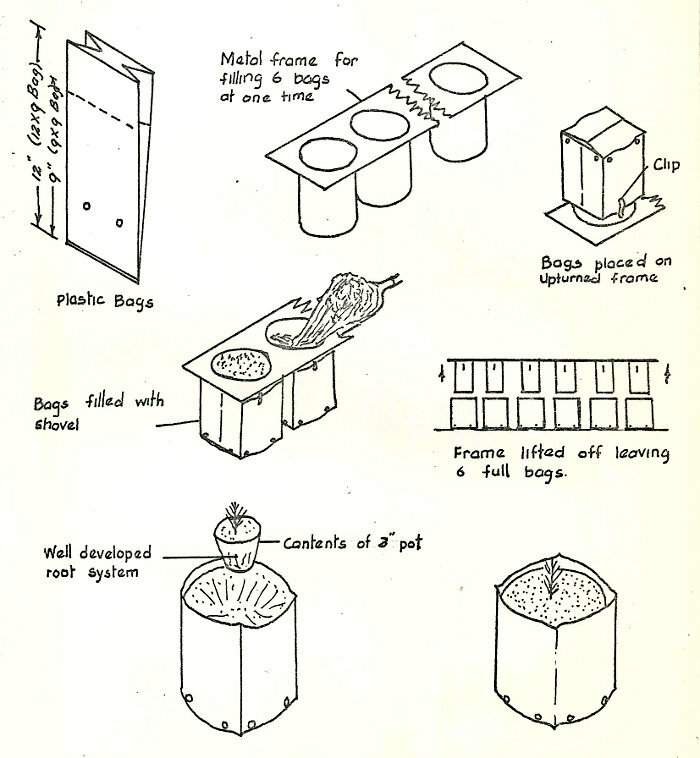 (Fig 6) These beds, developed at Parks and Gardens Research Section (Setchell 1967), are housed in a propagation room, which has double brick walls and an insulated ceiling. Air movement in this room is controlled by two 3 speed exhaust fans in the ceiling and 4 shuttered ventilator s in the walls. The air temperature, thermostatically controlled, is maintained at a minimum of 70°F (21°C) by four infra red strip heaters on the walls. In the summer the air temperature rises considerably above this, but an evaporative cooler is being installed so the maximum temperature can also be controlled. 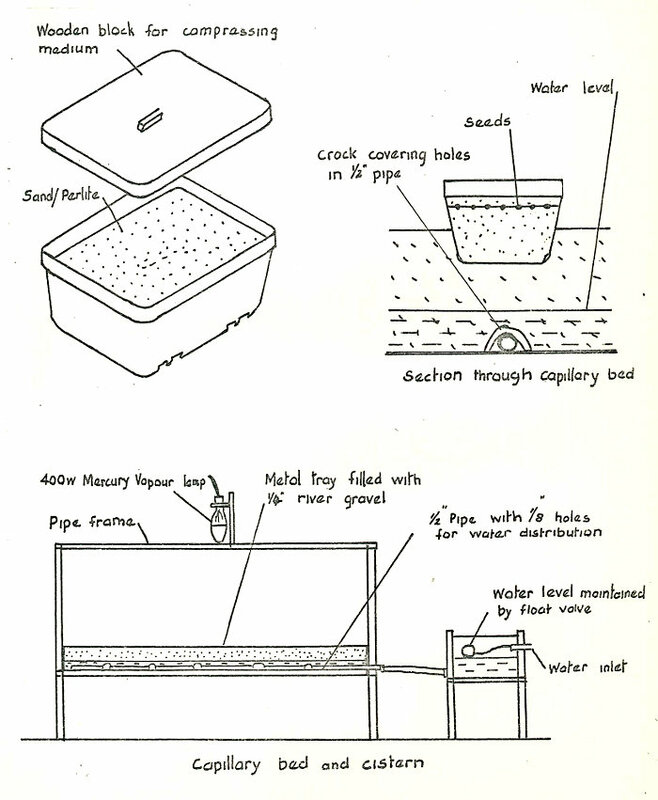 Fig 6: Capillary bed and cistern. One 400 watt Mercury Vapour horticultural lamp is mounted over the centre of the bed, 28" (71 cm) above it. The light is controlled by a time clock. The light is only necessary for seedling growth after germination, and at the moment a 10 hour day is used. Each bed is 2'4" (66 cm) wide, and 5' (152 cm) long and 3" (7.62 cm) deep, and holds approx. 100 punnets. Water is distributed evenly to all parts of the tray by three 1/2" (1.27 cm) copper pipes with 1/8" (3.17 mm) dia. holes every 9" (23 cm). These are covered with pieces of crock or plastic to prevent them clogging up and the tray is filled with coarse washed river gravel (about 1/4" (6.35 mm) dia.). The water level is maintained in the tray by adjusting the ball in the cistern. This level is usually maintained at about 1" (2.54 cm) above the bottom of the tray. The punnets are placed about 3/4" (1.90 cm) into the bed and the gravel is pressed around the sides. The water rises up to the surface ensuring that the seeds will always be moist and well aerated, but never over watered. The seedlings are pricked off into 3" (7.62 cm) pots (using the same medium as described for cuttings) at the cotyledon stage or as soon after as possible. This method of seed germination has proved very successful over a very wide range of seeds, and has many advantages. It does not require any watering from the time the seeds are sown till they are pricked off. Germination is good and there is very little loss from damping off and other diseases, probably because the seedlings are in sterile media which is generally unfavourable for fungi, etc. The consistency of the sand/perlite mixture also makes pricking off easy, because it does not require much effort to break it up and this lessens root damage. It is hoped to be able to heat one of these trays with floor heat cable under the tray to raise the water temperature, which will increase germination rates, particularly in the winter. Seedlings in 3" (7.62 cm) pots receive exactly the same treatment as that described for cuttings. Many seeds have impermeable seed coats (such as Acacias, Papilionaceae, etc), and these usually require pre-treatment to overcome this. Until recently this physical dormancy was broken by placing the seeds in boiling water and allowing the water to cool, and repeating this process if necessary until the seeds become swollen. Even though this method has proved reasonably successful with many species a method which gives more reliable results has been developed using a seed scarifier. 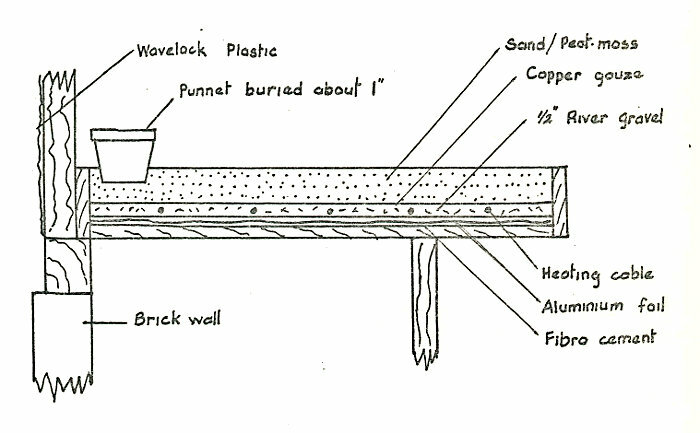 Fig 7: Diagram of Seed Scarifier. This scarifier is similar to that designed and developed by C.S.I R.O. Plant Industry (Ballard 1967) for scarifying clover seeds. The seeds are placed in the chamber and they are rotated by the compressed air against the emery paper lining the chamber. This abrades the seed coat and allows water to penetrate it. This machine is extremely efficient and the conditions are repeatable, i.e. once a suitable treatment is found for a particular seed, this can be reproduced at a later date. (b) Grade of emery paper - for nearly all purposes a fairly fine 240 grade paper is used. It has been found that coarser paper tends to cause damage to the seeds. (c) Number of seeds - more small seeds can be scarified at the one time than large seeds. (d) Amount of time the seeds are scarified - e.g. Clianthus formosus seed required 2 mins at 11 psi with 240 paper while some Acacias required 25 psi for 15 minutes. The method used to determine the amount of scarification necessary is to scarify the seed for a couple of minutes at, say, 10 psi and see how much abrasion has occurred on the seeds. An estimate is then made for further scarification. When a considerable amount of abrasion has occurred, but not enough to damage cotyledons or embryo, the seeds are soaked in hot water. If the treatment is sufficient they will begin to swell within a few minutes. If they do not swell within 1/2 hour they are dried and rescarified and the process is repeated. By using this method on a large number of seeds experience is gained at estimating the correct amount of pressure and time, etc. This method has speeded up germination rates and increased percentage germination in Acacias and Papilionaceae. It is very useful for dealing with small numbers of seeds, but for larger amounts of seed a larger scarifier may be necessary. Following a recent infection of Phytophthora cinnamomi in the Botanic Gardens, and particularly in nursery stock in plastic bags, an intensive programme of nursery hygiene has been embarked upon. This programme has included the fumigation of cold frames and sub-irrigation bays with formalin after infected plants and containers which may have been carrying the infection had been removed. This is done by spraying the cold frames and bays with 5% formalin and covering with plastic for at least 24 hours. Care is taken not to allow vapour to come into contact with plants. When the plastic is taken off the areas are not used for a couple of days. Prior to the infection, soil was not sterilised and a soil mix of mainly Jervis Bay soil was used for general propagation in 3" (7.62 cm) pots and plastic bags. It was considered essential to begin sterilising soil to prevent pathogenic organisms , particularly Phytgphthora being introduced via the soil. To do this a soil sterilising unit was designed and purchased. Steam is supplied by an Allan electric 12KW Master steam generator. 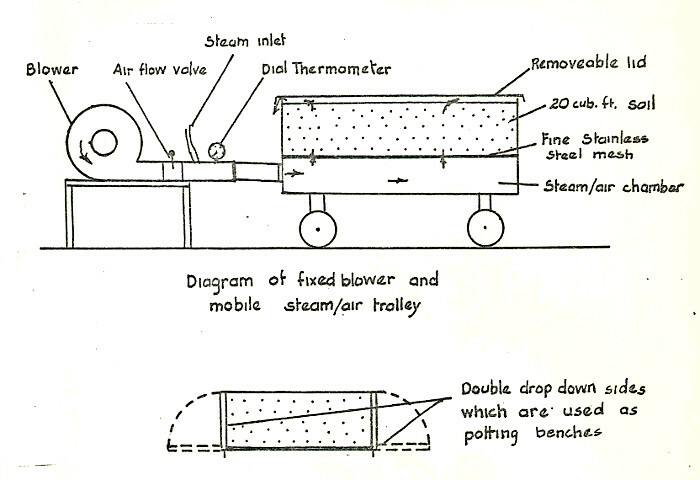 The fixed blower driven by an electric motor, and a mobile 20 cubic ft. (566 L) trolley with double drop down sides were designed and built by D & W Engineering, Melbourne. The trolley is mobile and is used as a potting bench by dropping one or both sides down. The soil mixture had to be changed to a UC mix (already described) because the Jervis Bay soil was too fine to allow the steam/air to pass through it at a reasonable rate. 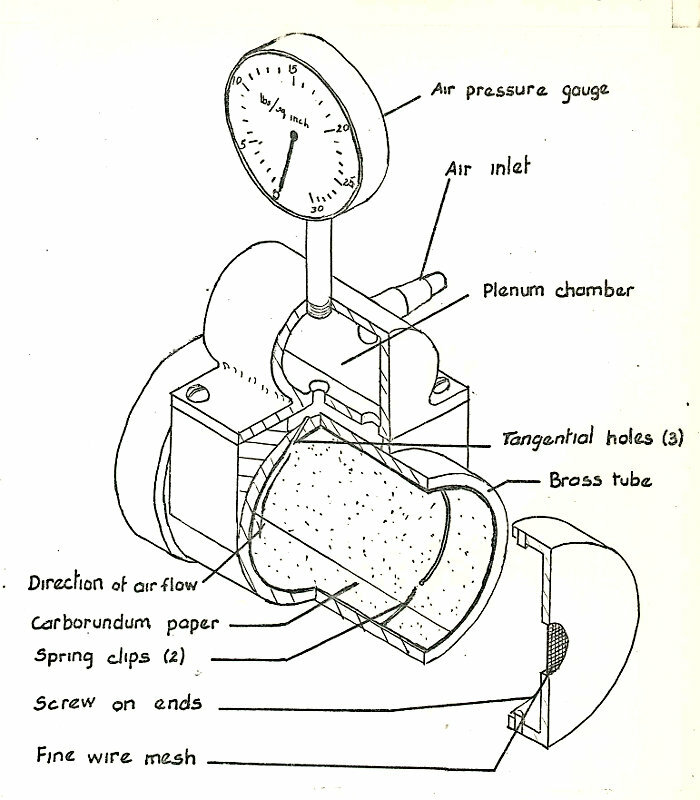 Fig 8: Diagram of Steam/Air Unit. The temperature of the steam/air mixture is regulated by altering the air flow from the blower or regulating the amount of steam. This gives a range of temperatures between ambient air temperature and 212°F (100°C). A temperature of 150°F (65.5°C) on the dial thermometer (Fig. 8) gives a temperature of 140°F (60°C) in the soil in the trolley. The unit has proved extremely efficient, taking about 45 minutes to heat 20 cubic ft. (566 L) of UC mix to 140°F (60°C). This temperature is maintained for 30 mins .which is sufficient to kill all pathogens but does not completely sterilise the soil. The remaining micro flora act antagonistically against any organisms accidently introduced after treatment (Olson 1964). The steam is turned off after approx. 30 minutes at 140°F (60°C) and. the blower is left on, fully open. This cools the soil very quickly and it is ready for use in about 20 minutes. Pots, tools etc. are sterilised in the trolley at 212°F (100°C) by using only steam. Other hygiene precautions taken include keeping the potting area a "clean" area by keeping it free from unsterilized pots , soil, tools, etc ., avoiding walking across, on or in sub-irrigation bays; and making sure boots, tools etc. are cleaned before moving into clean areas. Sub-irrigation has one major disadvantage and this is soil borne pathogens. With mobile zoospores such as Phytophthora can be spread from one container to another during the watering process. However it is felt that it can still be used successfully if very strict methods of hygiene are closely adhered to. The advantages of this method of watering make this worthwhile. Ballard, L.A.T., Buchwald , T. and Grant Liff, A .E. 1967. A Laboratory Seed Scarifier. - Australian Seed Testing Newsletter No. 8 : 10 - 12. Aerated Steam Treatment of Soil - Its Principles and Application. - The International Plant Propagators Society 14 : 305 - 308. The use of Capillary Benches for Seedling Production. - Seed and Nursery Trader April 1967. Wavelock was a type of vinyl fabric often used for outdoor furniture. Electrical work should only be carried out by a qualified electrician.